US nuclear power plants achieved their highest level of generation ever in 2018, despite the closure of several plants since the previous peak, according to the US Energy Information Administration (EIA). 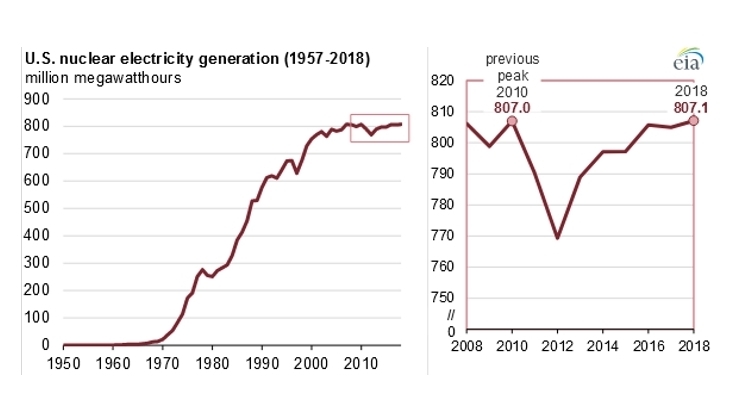 Capacity additions from plant uprates, combined with shorter refuelling maintenance cycles, enabled the country’s nuclear plants to produce 807.1 million MWh in 2018, surpassing the previous peak figure of 807.0 million MWh which was recorded in 2010. Only one new plant – the Tennessee Valley Authority’s 1.2 GWe Watts Bar 2 – has come online in the USA since 2010, the EIA said. It recorded 2.0 GW of thermal uprates to nuclear power plants between 2010 and 2018, which it described as “nearly the equivalent” of adding two new reactors similar to Watts Bar 2. Seven plants with a combined capacity of 5.3 GWe have retired since 2013. A total of 98 reactors at 60 plants were in operation at the beginning of 2018. “The combination of uprates, shorter outage durations, and balance-of-plant thermal efficiency improvements led the US nuclear power fleet in 2018 to see its highest capacity factor on record at 92.6%”, the EIA said, adding however this is not likely to be surpassed. Georgia Power’s Vogtle 3 and 4 – due to come online in 2021 and 2022 – will add 2.2 GWe of additional power, but this will not offset the capacity that is expected to retire over the next seven years based on announced retirements, the EIA said. Two plants – Pilgrim in Massachusetts and Three Mile Island – are expected to retire this year, and the closure of a total of twelve reactors by 2025 will see US nuclear capacity fall by 10.5 GWe. Opportunities for further uprates are also “shrinking”, the EIA said, with the US Nuclear Regulatory Commission anticipating only 60 MW of thermal uprate applications in the period to 2020. “Current market conditions – the combination of relatively low wholesale electricity prices and flat demand growth – do not provide the financial incentives plant owners require to invest in improvements that would increase output from the existing fleet,” it said. Net electricity generation from US nuclear power reactors is projected to fall by 17% by 2025 in the EIA’s Annual Energy Outlook 2019 Reference case. The loss of nuclear power is expected to be largely offset by output from new natural gas, wind and solar power plants, it said.